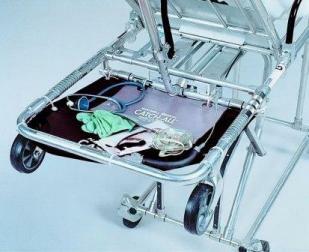 The CATCH-ALL provides an easy and convenient storage area for small medical equipment used frequently on EMS calls. Five models have been created to fit the majority of ambulance cots that are currently used in the field today. Whether you need storage for a pocket mask and stethoscope, or a handy shelf to transport the patient's clothing and personal belongings, the CATCH-ALL is your solution.